Loch Katrine is the main raw water source for the north of Glasgow, located within the Ben A’an and Brenachoile SSSI and the Trossachs National Park (which is a Special Area of Conservation and National Scenic Area). 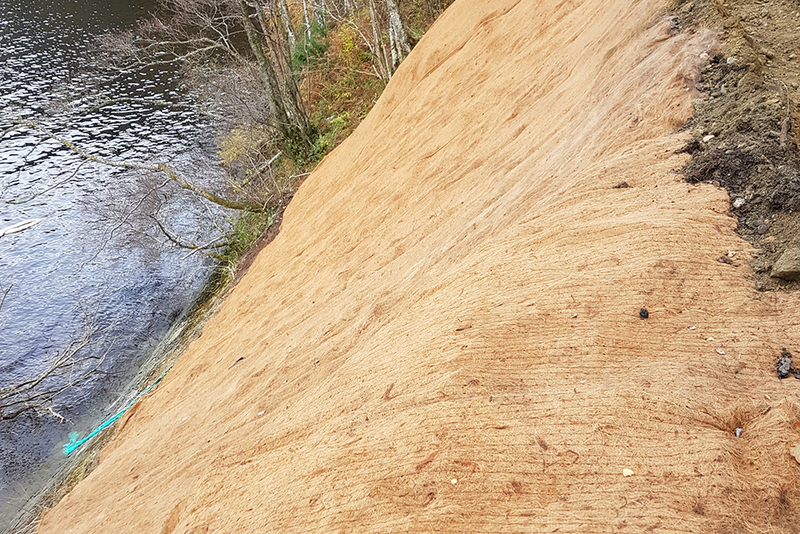 When a section of the loch’s bank suffered a landslip, it threatened the only road serving residents, visitors and those maintenance vehicles working on behalf of Scottish Water. Remedial works were therefore urgently required to stop further deterioration of the slope undermining the road and to rebuild the bank to match the surroundings. Atkins designed the scheme and CAN was appointed by George Leslie Ltd to undertake the remedial works. Due to the steep nature of the slope and absence of dry ground below the work area, rope access was chosen as the best method of access for this site. Plant size was severely constrained by the limited road with remaining above the slip and the need to minimise crest loading. Working directly above water demanded stringent environmental and health and safety standards to be maintained. Environmental protection of the loch was increased by installing a temporary “shelf” on the lower section of the bank to catch any potential grout loss. Stability was initially improved by installing 113no. 6m long soil nails, using R32-280 hollow bar over the slip area and into the unaffected areas either side. Nails within the upper slope were drilled using an excavator, mounted with a drill mast and under-reaching from the road. The uppermost nails were then used to suspend an A–frame drill rig, which could reach the lower sections of the slope. CAN then assisted George Leslie with the excavation of the face to create benches. 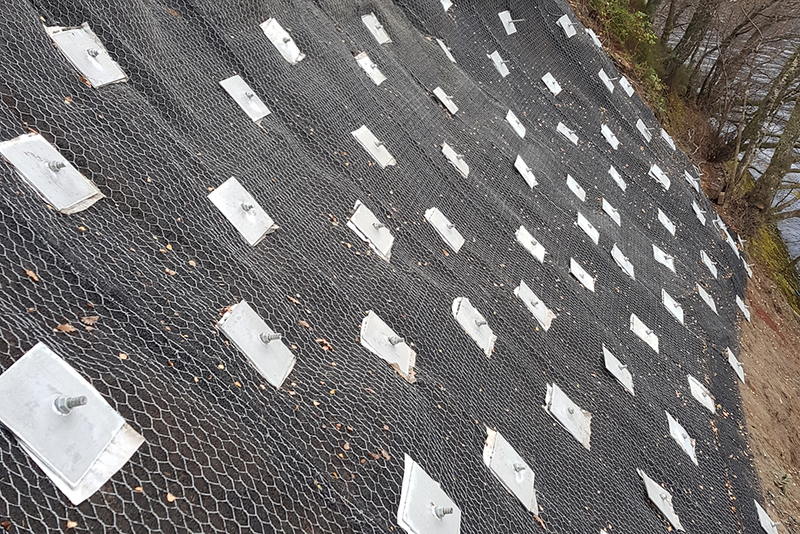 Granular fill was placed on these benches to create an even surface profile and overlaid with 270m² of MacMat-R secured with soil nail head plates. 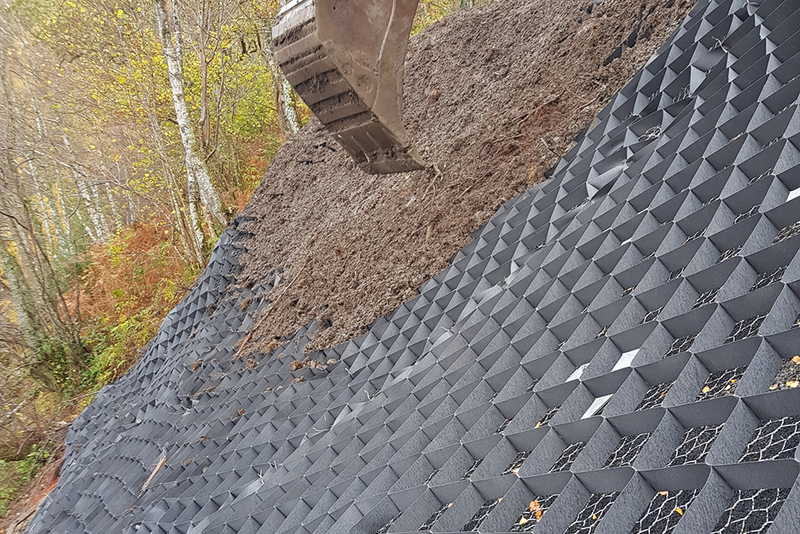 A cellular erosion protection system was installed on top of the MacMat-R and filled with soil. Due to the time of year, this was then covered with hessian to prevent the soil from being washed away until it was seeded or planted the following year.